Dorky… yes, I know – but yesterday on my way to work I was ecstatic to see the fruits of last fall’s guerrilla gardening project continuing to bless Spring Street. The daffodil bulbs that the 25+ participants of the guerrilla gardening party in October planted are now in bloom!A little bit of bright yellow in the plant wells along Spring Street adds happiness and hope of good things to come. Something we can all probably use right now in the midst of tough economic times and at the end of a long winterGreg Watkins, of Islandscape Landscaping, and I got so excited by the daffodils that we began discussing our next Guerrilla Gardening adventure. Stay tuned for something fun this spring! 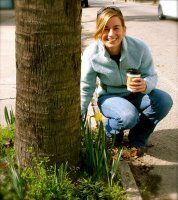 In the meantime… Next time you are driving down Spring Street in the Elliotborough neighborhood of Charleston, SC – check the plant wells between Coming and Rutledge Streets for little pockets of yellow love.